If you’re not a Byzantine Catholic and are unsure and curious about what you’ll encounter when you visit, we think you’ll find the information on this page helpful if not downright interesting! Watch this brief description of Byzantine Catholic worship and further explanation in the text below. If this is your first visit, you may find it somewhat difficult to follow the prayers of the Holy Sacrifice of the Eucharist, which Byzantine Catholics refer to as the Divine Liturgy. Don’t feel compelled to keep up; were just glad that you have joined us in worship today. We are Catholics in communion with the Bishop of Rome, Pope Benedict XVI, whom we recognize as the visible Head of the Catholic Church. The local Roman Catholic Bishop, the Bishops of the United States, and the whole world recognize us as being Catholic. As part of the One, Holy, Catholic and Apostolic Church, we are identified as Eastern Catholics and share the same faith and we have the same seven Sacraments. The difference is that as Eastern Catholics, we have a different way, or rite, of expressing our Faith in regards to Liturgy, customs and theology. The Divine Liturgy, the offering (sacrifice) of the Body and Blood of Christ, is the central act of worship. 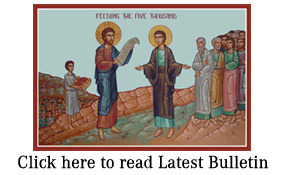 The Byzantine Liturgy is one of the most widely celebrated in U.S. Eastern Catholic Churches. It has several different forms, but the principal one used daily by most Eastern Catholics is the Liturgy of St. John Chrysostom. St. John Chrysostom (349-407) was Archbishop of Constantinople and a renowned preacher and biblical scholar. The liturgy was adapted from the Liturgy of St. James of Jerusalem. The Divine Liturgy can be divided into three main parts and can also be explained as a mystical approach to the life of our Lord. The Life of Jesus Christ is usually divided into three periods, namely: 1) The hidden life; 2) the public life; and, 3) the salvific life, or Christ’s work of salvation. Corresponding to these three periods of Christ’s life, the Divine Liturgy can also be divided into three consecutive parts: 1) The Preparation (proskomedia), the rite of preparing the holy gifts (bread and wine) at the side altar, which enacts the sacrificial life of Jesus; 2) Liturgy of the Word, with the readings of the Holy Scriptures and the sermon, which celebrates and teaches the public life of Jesus; and, 3) Liturgy of the Eucharist, which communicates our Lord’s salvific work: His passion, death on the cross, His glorious resurrection, and His ascension. As Eastern Catholics, we celebrate the Divine Liturgy according to the Ruthenian tradition of the Byzantine Rite. This Liturgy will have familiar parts — Scripture readings, Eucharistic Prayer, and Holy Communion — but the ceremonies surrounding them will be different. If it’s your first time in attending the Byzantine Divine Liturgy we’d recommend to listen to the prayers and readings. Don’t try to follow the pew book. Immerse yourself in the rich tradition that attempts to bring true worship from heaven to earth. The following are some comments that may be helpful in participating in today’s Liturgy. Blessing oneself with two fingers brought to the thumb represents the Trinity. The last two fingers held to the palm represent the two natures of Jesus–God and man. For the first 1,200 years of the Church, in making the Sign of the Cross, the hand was typically brought from the right to the left shoulder. In the East this is still the practice, to signify Christ enthroned at the right hand of the Father. According to tradition and in the words of Pope Innocent III (1198-1216), The Sign of the Cross is made with three fingers because it is impressed upon us in the name of the Holy Trinity. From the forehead we pass to the breast, then from the right to the left. (Quoted in Gasparri: Catholic Catechism, p. 248). Icons are revelation in pigment and paint. In front of the altar, usually on an iconostasis, which is the screen partition that unites the mystical heavenly (sanctuary or Holy of Holies) to the earthly (nave), you see two icons flanking the altar. The icon of Mary with the Child Jesus in her arms reminds us of the first coming of Jesus, the God-man. The icon of Jesus by Himself represents His Second Coming at the end of time. The altar beckons us to enter into Gods presence and to put aside all earthly distractions. Icons make us remember: not a passive recollection of a past person or event, but a remembrance that transforms. This is one of the foundation stones of Christian liturgy – that the remembrance makes present the reality. We use incense as a sign of reverence for the sacred place and the sacredness of the people who are made in Gods image and as a sign of preparing for something important about to happen in the Liturgy. It is our prayer ascending like the smoke of incense before the throne of God. We bow and make the Sign of the Cross many times during the Liturgy, as a sign of our faith, and the receiving and accepting of Gods blessings. Following the making of the Sign of the Cross, reverence to God is further expressed by bowing the head. We bless ourselves every time we mention the Persons of the Trinity by name, or whenever the priest blesses the congregation. We also bow and sign ourselves whenever we enter or leave the church. Our altar bread is made with yeast (leavened) to symbolize that Christ is Risen! At the beginning of the Liturgy, the priest will cut a loaf of specially baked prosphora and prepare cubed particles that will be used for distribution of Holy Communion. This is a barrier that divides the holy altar, in the sanctuary, from the body of the church. The screen has three openings: the royal doors in the center and two smaller doors called deacon doors. There can be one icon on the screen, or many, but all are hung according to an established order. The royal doors are flanked by the icons of Christ (on the right) and the Mother of God (with Christ) on the viewer’s left. It is the Lord as He came in history, and the Lord as He will come again when history is no more. On the far right is the patronal icon of the parish, St. Athanasius, and in the far left. is the patron saint of the Byzantine Church, St. Nicholas. If the altar is the highest heaven and the nave the place of transfiguration, the iconostasis is both a window and a mirror. It reveals to us glimpses of the glory of heaven, those transfigured by the divine life. IS THE BYZANTINE CATHOLIC CHURCH REALLY CATHOLIC? Emphatically, yes! The Byzantine Church is in complete communion and allegiance with the Pope in Rome and has all of the same valid Sacraments as the Roman Catholic Church. DOES THE BYZANTINE DIVINE LITURGY FULFILL THE SUNDAY OBLIGATION? Yes. The Byzantine Divine Liturgy is the same re-creation of the Last Supper as the Roman Rite Mass. The Divine Liturgy is offered by a validly ordained priest recognized by and in union with Rome. DOES THE BYZANTINE LITURGY USE MUSICAL INSTRUMENTS? No, Byzantine liturgical tradition emphasizes that we offer ourselves to God as we are. We bring only ourselves and stand before the Creator and we worship with our God-given voices without any manmade instruments. All liturgical prayer, therefore, is sung a capella (without accompaniment). OTHER THAN ENGLISH, WHAT LANGUAGE IS USED IN THE LITURGY? St. John Chrysostom originally recorded the Divine Liturgy in Greek. Later, as Ss. Cyril and Methodius brought Christianity to the Slavs, they translated the services into Slavonic. In the Byzantine Catholic Church in America, the liturgy was translated into English in the 1950s, but many churches continue to include some traditional Slavonic in worship, especially the second verse of the hymns and seasonal greetings. WHY DOES THE PRIEST HAVE HIS BACK TO THE CONGREGATION? Actually, he is facing to pray in the same direction, east, as the worshiping faithful. The priest is the representative of the congregation. The sanctuary and tabernacle are the heavenly throne of God, so the priest faces God, the object of our prayers, and he speaks to God on our behalf. HOW IS THE DIVINE LITURGY DIVIDED? WHAT IS THE DIFFERENCE BETWEEN THE DIVINE LITURGY AND THE MASS? There is no theological difference; that is, both are the same event, Sacrifice and Eucharist. The word liturgy came from the Greek ‘leitourgia,’ which means a ‘public gathering.’ The term mass comes from the Latin “ite, missa est;” “go, you are dismissed,” from the dismissal at the end of the Mass. Both terms, however, are synonymous in meaning and describe the same event – our worship to our Creator.